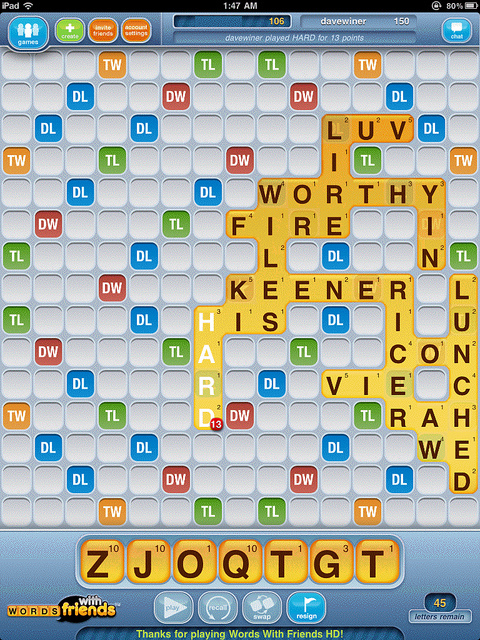 Since getting my smart phone, I’ve been playing lots of Words With Friends. I don’t play my friends because I’m embarrassed at how terrible I am at the game. I’ve played, oh, about 30-50 games against Realm. I’ve won one game. One. Words With Friends via flickr. The resulting ego plunge has left me less than confident in my vocabulary skills. (Disclaimer: Though I recognize a ton of words and know their meanings, I cannot pronounce them properly to save my life. I’d blame this on society, but Dictionary.com provides an icon to listen to any word you look up…which I forget to use.) I mean, how can a writer who knows the correct spelling of omphaloskepsis go wrong? I think the answer lies in the amassing of little-known two and three-letter words, such as “qi” and “xu” and “qat.” My mom, whom I have yet to beat, uses the ingenious method of placing random letters together until she comes up with something like “vang” for an astronomical amount of points. Then she messages me, “I didn’t know that was a word!” Yeah, play innocent, Mom. Realm knows I’m playing for serious. I want to beat him so badly. So, he’ll tease me while I’m making dinner. One good thing could come of this. If I learn enough of these two-letter babies, they could replace the longer ones in my manuscript, reducing the word count considerably! I’ll be one with qi then. We have smaller closets, so I’m attempting to maximize closet space. I was very spoiled in our last house because I had a closet to myself. (You might remember, I liked to hide out in there to write.) Now that I’m sharing a closet with Realm, I refuse to give up having my dresser in my closet. Keeping my clothes in one location truly saves time. Unfortunately, there was no place to put my shoes. I try to be sensible about my shoes…except for the ones with the mismatched shoelaces. Those were free. 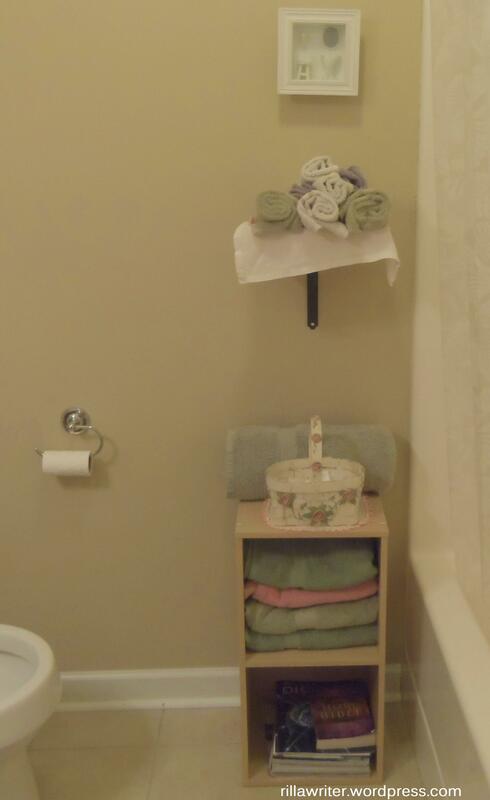 In the bathroom I wanted to set out towels and toiletries for guests. 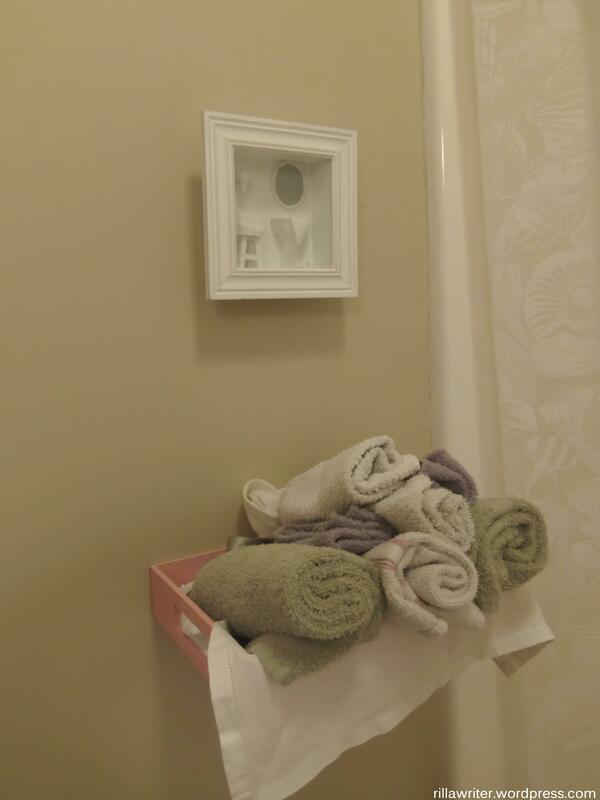 I bought the little white shadow box bathroom scene for 99 cents at the thrift store, along with the little pink tray holding the hand towels and wash cloths for $1.59. I found the two-section shelf at another thrift store for $5. If you want your son to read something, put it in the bathroom. I found the blue and green containers at the dollar store. 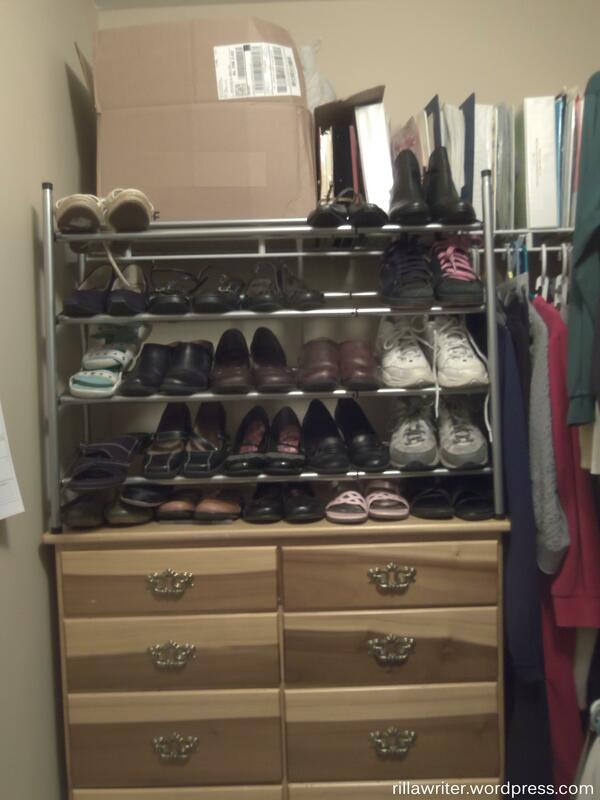 I already had the shoe rack, which was too bulky to work in my closet. 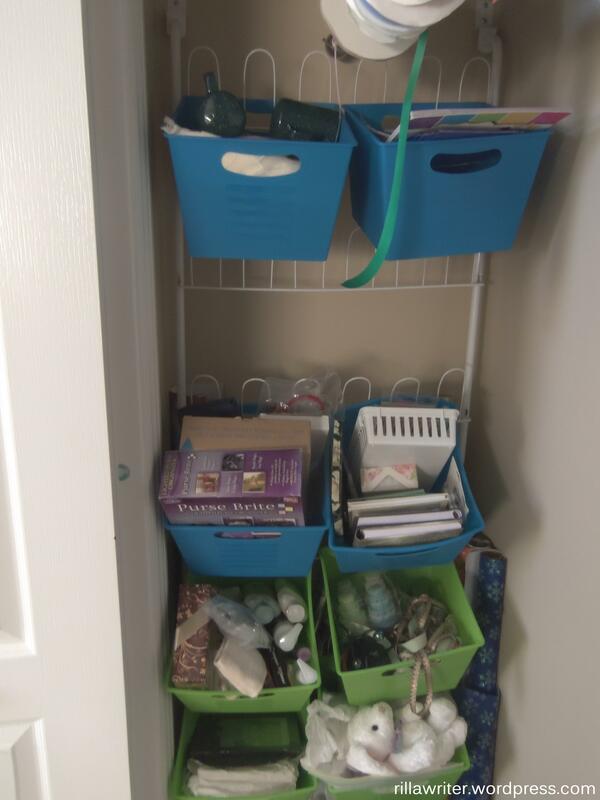 There is space behind the shoe rack to keep the rolls of cellophane for the baskets. I omitted a row to get to the rolls easily. I’m so motivated to see these containers empty!! All this space-saving means I can sit down amidst my usual piles of stuff and write without the frustration of a dozen waiting boxes staring me down. Waiting boxes do stare. I saw one out of the corner of my eye while writing a poignant death scene the other day. And it shut its eyes in a flash when I looked up to catch it. This week didn’t go smoothly. Each of my kids is sick and has an ear infection, so I’ve been Rilla the Mom-on-Call for wacky hours. I’m doctoring, cuddling, lack of appetite trouble-shooting, and germ control-managing 24/7. Rilla the Blogger will, hopefully, be back next week. Keep us in your prayers.